128 p., 15,5 x 23,0 cm. With contributions by Bret W. Davis, Rolf Elberfeld, Ralf Müller, Kitarō Nishida and Ryōsuke Ōhashi. Trying to locate Nishida’s philosophy in the history of philosophy, the notion of such a history cannot be assumed without question. Nishida’s philosophy shares many essential elements with Western philosophy, but it is also rooted ›outside‹ of this philosophy, in Buddhism, Taoism and Confucianism. The years before and after 1911, when Nishida’s inquiry into the good appeared, are the dividing line between the philosophy of the 19th and 20th centuries. Nishida’s philosophy forms a part of this era, characterized by being formed in the non-European world. Nishida’s philosophy in the strict sense begins with the idea of »place«. The »place« is the starting point to develop a form of a philosophical logic for the East Asian experience of »absolute nothingness«. 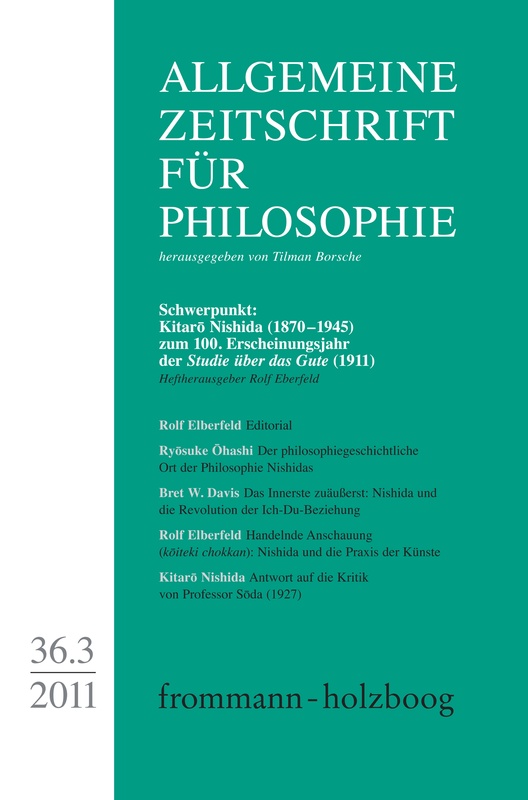 If in philosophy »nothingness« is obtained as the groundless ground of being, as we can also see in other philosophies, the philosophy of Nishida goes back into this groundless ground to bring up a new view of the history of philosophy itself. Nishida Kitarō developed a revolutionary account of the I-Thou relation, according to which the true self, in its deepest recesses, is turned inside out so as to be radically open to alterity. He thus offers an original and significant contribution to a countercurrent to the tendency toward solipsistic subjectivity in the history of modern Western philosophy. With his watershed essay ›I and Thou‹ (1932) he deserves to be recognized as key figure in the revolutionary movement toward an appreciation of alterity, a rethinking of community, and the development of an essentially dialectical, dialogical, interpersonal, and social conception of the self. The aim of this essay is to elucidate Nishida’s account of the I-Thou relation and to make a case for its contemporary significance by setting it in critical dialogue with other philosophers who have addressed this topic, including Scheler, Husserl, Buber, Lévinas and Ricoeur. In Nishida’s thought of acting intuition various motifs of his philosophy come together. Two points are brought to the fore: The overcoming of the substantial distinction between body and consciousness and a dynamised understanding of reality developed from the paradigm of processes of artistic creation. In the first part the horizon of Nishida’s philosophy is outlined with respect to Descartes, Fichte, Hegel, Husserl, and Heidegger. In the second part, key positions Nishida developed before bringing up his idea of acting intuition will be taken into account. The third part focuses on the idea of acting intuition. In the fourth part, the grammatical form of the middle voice in Japanese language is discussed in the context of Nishida’s use of language as a form of acting intuition. The last part discusses the implications of Nishida’s artistic experience as a calligrapher in East Asian tradition for his approach to philosophy. This is the first German translation of an article from the middle period of Nishida’s thought, in which Nishida discusses a new logical foundation for his thinking developed a year before. At this time he first used the expression »place of absolute nothingness« which belongs to the core of his later philosophy. The expression, neither immediately accessible nor easy to understand, was citicized by other Japanese philosophers. In this essay, originally published in 1927 in the Japanese journal ›Philosophical Research‹, Nishida replies to the criticism raised by the neo-Kantian philosopher and economist Sōda Kiichiro in the same journal in 1926. Nishida’s reply to Prof. Sōda does not present the final position he reached in his philosophy. He continued writing philosophical essays for another 19 years, deepening his own thought until his death in 1945. This article is remarkable for the fact that Nishida tries to reveal as accurately as possible the fundamental motives of his approach at that time. Ralf Müller: Japanese and Continental Philosophy. Conversations with the Kyoto School, herausgegeben von Bret W. Davis, Brian Schroeder und Jason Wirth.